The easiest way to think of the Water Cooler is as a Facebook-type social network that only people in your company can access. You can post questions, have conversations, and even chat one on one with your colleagues. Basically, it’s a way for you to collaborate more closely with your company to better support your customers. *This page describes the Water Cooler in detail. For a basic look, click here. Quick Tip: You can automatically add a Watercooler post using Ticket Automation. A usage example for this is to give a high five to your team when your customers leave positive ratings on tickets, or if they closed a urgent ticket quickly. Also, you can post urgent ticket notifications to the Water Cooler. Add Attachment: Add an attachment to the post. Max file size for attachments is 25 MB. Associate Ticket: Search by either name or number to associate a ticket. Associate User: Associating a user will give only you, and the associated users visibility to the post. Users avatars are uploaded in the User Section. Associate Activity: Customer Activities organize non-ticket related information that the whole team can use to understand and build the Customer relationship. You may associate a Water Cooler post to a Customer Activity in order to notify others on your team. If you make an association, once you add the post, you will see a little “i” icon to the right. When people hover over this, they can see the associations and click them to open in a new tab. Also, when someone posts something new in the Water Cooler, everyone else will receive an audio and a visual indicator. The Water Cooler menu on the left navigation will display the unread posts for that user. You can click on the Water Cooler link within a ticket and start a post. When you do this, the ticket is auto associated. For example, if you are working on a ticket and want to ask your team a question, simply click on the Water Cooler link within the ticket and add your post. It will appear in the ticket in sequential order along with the actions, but also the main water cooler section as well. You can filter out the Water Cooler posts by clicking the blue WC button in the upper right hand corner of the ticket. 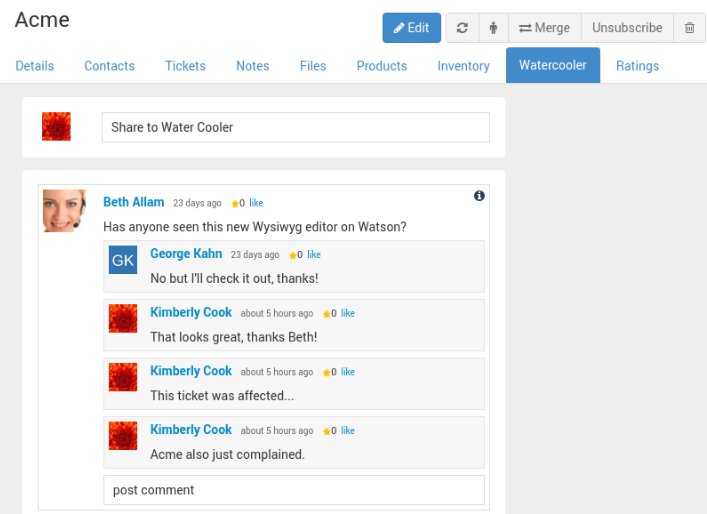 Each customer record has their own Water Cooler tab which will show all of the posts that have been made about this customer – and just like tickets, you can start a post from the customer section/Water Cooler tab. Doing it this way will auto associate the customer to the post, but you can also associate tickets, groups, other customers, users and products as well from here. You can limit who sees each post by individual user as well a groups. For example, if you wanted to share something to your support team, but hide it from the other groups, simply associate the post to your group. Only those within that group will see the post. The same applies if you associate a team member to the post. Only they will see it and be able to comment on it.